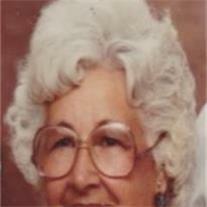 Dorothy Shill Clevenger passed away April 28, 2011 in Mesa, Arizona at the age of 91. Dorothy, an Arizona native, was born May 10, 1919 in Phoenix to Harry Shill, Sr and Nettie Lockett Shill. She is preceded in death by her brothers, Harry Jr, Theodore, Quinton and sisters Vernetta (Fuller), Norma (Power). Dorothy is survived by her beloved husband of 71 years, Earnest Andrew Clevenger, Sister-in-Law Sherlyn Shill, 5 children: Earnest Andrew Jr, David, Jack, Judith (Roland), Linda (Smith), 15 grandchildren, 65 great-grandchildren, and 3 great-great-grandchildren. While attending Mesa High School Dorothy, along with her sister Norma and best friend Sally Stewart, decided to “rebel” by wearing matching pant suits and ties to school. Of course this was seen as unacceptable behavior for girls and they were quickly sent home to change into dresses. Luckily however this did not prevent her from later gaining employment with Mesa Public Schools, where she worked for 23 years as a baker. Dorothy enjoyed fishing on Black River and was proud to say that she won a fishing contest in 1973 for catching the largest trout. She has passed her love of gardening and the outdoors on to many generations after her. She also enjoyed crocheting; every member of the family received snowflakes at Christmas and she made sure that every baby had a set of towels. As a member of the LDS church Dorothy served diligently in whatever capacity she was asked. As the life of the party, she enjoyed any event that would allow her to be surrounded by family and friends. To say that she will be greatly missed is truly an understatement. A memorial visitation will be held from 6-8pm on Wednesday, May 4th at Bunkers Garden Chapel, 33 N. Centennial Way, Mesa, AZ 85201. Funeral services will take place at 11:00am on Thursday, May 5th at the LDS, Lehi Stake Center (1430 N. Grand Street, Mesa, AZ 85201).